My hubby dear has his breakfast pretty early but I prefer to have it after I have bathed and done my pooja. While having breakfast I usually watch the news channels, catch up with the whatsapp messages and also make phone calls that I have to for the day… call for the gas cylinder, social calls, whatever needs attention for that day. Anyway what really caught my attention was the news that in some Scottish stores the use of plastic bags has dropped by 90% since they introduced the 5p charge for bags. 500 billion to a trillion bags are used every year by the world. Without thinking we gather several bags when we go shopping and usually just throw them away in the dustbin. Stop and think what happens to those bags you have just thrown. It fills up the landfill sites. This land could be put to better use. Plastic finds its way to the ocean and eventually finds its way into the stomachs of the marine life, killing them. Plastic bags are found at the country side, on farms , forests, everywhere. These plastic bags are eaten by animals and thus endangering their lives. A single plastic bag takes 1000 years to degrade. Even after degradation, its still harmful to living things as they are still toxic. During my last visit to India, I was glad that many stores have chosen to charge extra for bags. This made us consciously remember to carry bags from home for our shopping. In UK where ever I have gone shopping, the cashier will ask if I need a bag. Some stores charge extra for the bags. Change can only come about if we all make a conscious effort to reduce the usage of plastic. I always remember to carry my shopping basket and bags whenever I go for grocery or vegetable shopping. I leave a small basket and bags in my car for unexpected shopping. My green grocer has a smirk on his face whenever I insist on re using the plastic bags and refuse a new one. On the other hand, the cashiers at Nakumatt are happy whenever I tell them that I have brought my own bags. My house help cannot comprehend why I would not want to take a bag/bags with the shopping I do. He tells me that I am wasting my hubby’s money as according to him, whatever I pay for the shopping includes the price of bags. I cannot still make him understand the effect plastic has on our earth. They all call the plastic bags, paper bags and I am actually tired of explaining to them that they are not paper bags! Are you doing your bit by reducing the usage of plastic? Lets get to the recipe. Today I made mushroom egg fried rice. I love the mushroom fried rice served at Shri Krishna in Bangalore. Its really tasty. I decided to add eggs as hubby dear loves egg fried rice. Here’s the recipe. Wash the rice and soak it in 2½ cups of water for 30 minutes. Drain out the rice and put the water in a pan to boil. Add ½ tsp salt, 1 tbsp oil and the rice. Cover and cook the rice till it is done. Let the rice cool down completely. Heat oil in a wide pan. Stir fry the onions till they become slightly soft. Add the garlic, ginger and sliced chilli. Stir fry for a few seconds and add the mushrooms. Stir fry the mushrooms for 1 minute. Add the remaining salt, soy sauce and pepper powder. Mix well. Pour it over the rice and keep on mixing till the rice becomes a bit dry again. Add sweet corn and mix. Garnish with spring onion and serve with stir fry vegetables or any manchurian or even on its own. You can make this rice without the eggs. If you use white rice then you will need less water. Brown rice usually requires more water to cook. Add any other vegetables of your choice. Adjust the spices according to your taste. 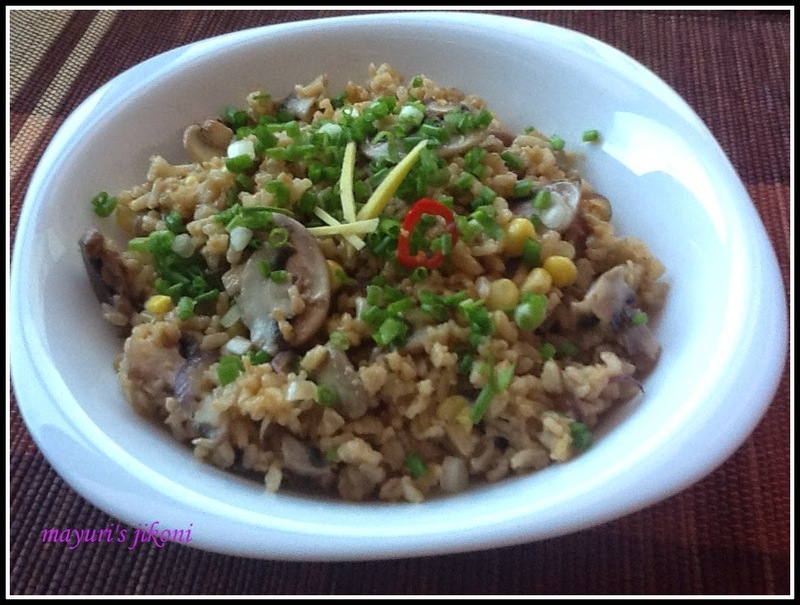 love this healthy version of fried rice. Love any kind of fried rice preparation. This looks delicious and really tasty.